What an interesting mouthful of a recipe name, right? I’ve been intrigued by zucchini noodles, or zoodles, since I first started to see them in recipes. I never tried them because I figured there was no sense in making something that only I was going to eat. Which obviously changed quite a bit when I decided to do the Whole30. I opted to just make ‘noodles’ out of the zucchini with a vegetable peeler since my mandoline is currently resting in my mother’s garage and I wasn’t interested in purchasing any of the kitchen gadgets out there designed to do this. I’m going to have a follow up post on zoodles because after making this recipe and not being overly impressed with them, I found that most people don’t actually boil their zoodles, they fry them or eat them raw. Now, that would have been good to know ahead of time, but I’m the only one to blame for not doing further research. So, please keep in mind that this recipe calls for boiling them which you might not appreciate and maybe you’d be more interested in another technique. 1. Preheat the oven to 350. Line a baking sheet with foil and place a wire cooling rack on top of the baking sheet. Spray with non-stick spray. 2. 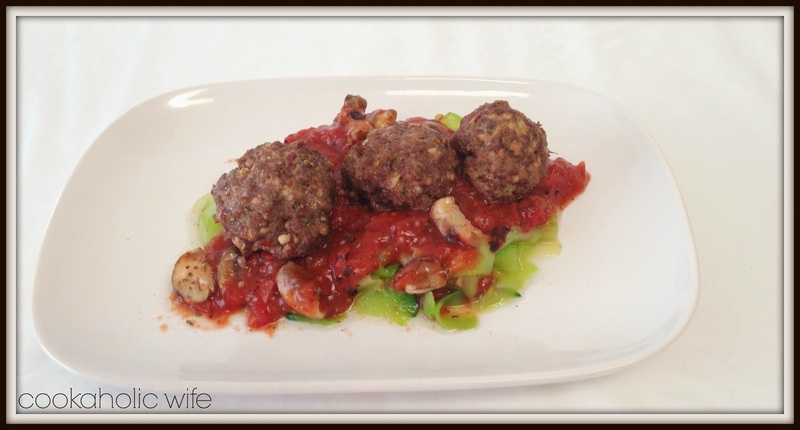 Combine the meatball ingredients into a bowl and form into 16-20 golf sized meatballs. Place on the prepared baking sheet. 3. Bake for 15-20 minutes or until cooked through. 4. In a skillet over medium-low heat, combine the fire roasted tomatoes, mushrooms and tomato paste together and cook until heated through and thickened. 5. Meanwhile, bring a pot of salted water to a boil. Drop in zucchini ribbons and boil for 1 minute. Drain a colander to remove excess water. 6. 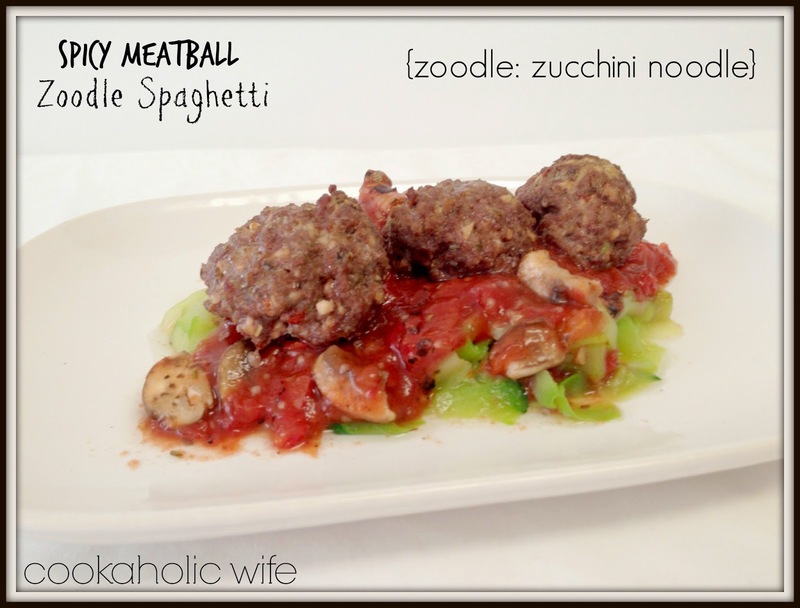 Plate the zoodles, top with the tomato sauce and meatballs. For Tom I made regular pasta and even garlic bread. While I haven’t wanted bread at all, garlic bread was difficult to turn down. I opted to eat in the other room so I wouldn’t tease myself too much by seeing him eat it.